Lip Balm Holder is an original PlanetJune Accessories crochet pattern by June Gilbank. Never lose your lip balm again (or have it melt in your pocket) with this stylish holder! 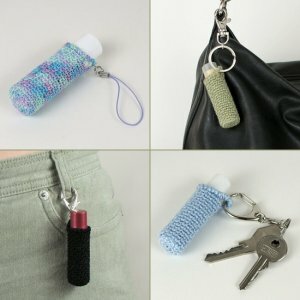 Clip it to your keyring, to your bag, or even to your belt loop and you’ll always have lip balm at hand when you need it. Quick and easy to crochet, just pop a lip balm inside and you have a perfect little gift! Send me a donation and receive the easy-to-print PDF version of the pattern as a thank you! Donations of any size are much appreciated, but please donate as much as you feel the pattern is worth. Just add the amount you wish to donate below, and, once you have checked out and paid, your pattern will be available to download from your PlanetJune account. Thank you for your generosity - it is much appreciated! Date Added: 09/06/2012 by Chrisie M.
Date Added: 05/18/2012 by Briana M.
Date Added: 04/22/2012 by Linda U. Date Added: 12/11/2011 by Hannah B. Date Added: 12/01/2011 by Judy C.